In this third installment, the all-star cast of authors tackle one of the fastest growing crimes in the world: Identity Theft. Now, the criminal hackers readers have grown to both love and hate try to cover their tracks and vanish into thin air… "Stealing the Network: How to Own an Identity" is the 3rd book in the "Stealing" series, and continues in the tradition created by its predecessors by delivering real-world network attack methodologies and hacking techniques within a context of unique and original fictional accounts created by some of the world's leading security professionals and computer technologists. 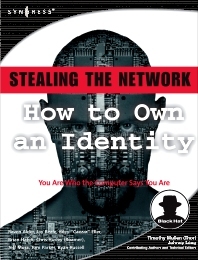 The seminal works in TechnoFiction, this "STN" collection yet again breaks new ground by casting light upon the mechanics and methods used by those lurking on the darker side of the Internet, engaging in the fastest growing crime in the world: Identity theft. Cast upon a backdrop of "Evasion," surviving characters from "How to Own a Continent" find themselves on the run, fleeing from both authority and adversary, now using their technical prowess in a way they never expected--to survive. The book will detail criminal, bleeding edge techniques for stealing or creating social security numbers, passports, bank accounts, credit card accounts, driver’s licenses, birth certificates, and more. The book will also portray the actions of federal law enforcement agents as they conduct forensic investigations of the cyber crime scenes and attempt to penetrate the clandestine world of criminal hackers. Ryan Russell (aka Blue Boar) has worked in the IT field for over 16 years. Chris Hurley is a Senior Penetration Tester in the Washington, DC area. He has more than 10 years of experience performing penetration testing, vulnerability assessments, and general INFOSEC grunt work. He is the founder of the WorldWide WarDrive, a four-year project to assess the security posture of wireless networks deployed throughout the world. Chris was also the original organizer of the DEF CON WarDriving contest. He is the lead author of WarDriving: Drive, Detect, Defend (Syngress Publishing, ISBN: 19318360305). He has contributed to several other Syngress publications, including Penetration Tester's Open Source Toolkit (ISBN: 1-5974490210), Stealing the Network: How to Own an Identity (ISBN: 1597490067), InfoSec Career Hacking (ISBN: 1597490113), and OS X for Hackers at Heart (ISBN: 1597490407). He has a BS from Angelo State University in Computer Science and a whole bunch of certifications to make himself feel important.